As part of the presentation the Commissioners signed pledge cards banning the “R” word. 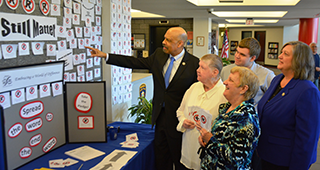 Last week, Commissioner Farrell and Commissioner Cozzone visited the “Words Still Matter” display in the lobby of the Government Services Center, where their signed pledge cards were posted among hundreds of other pledge cards. The Commissioners also met with some of MH/IDD’s self-advocates who, back in 2009, were part of a movement to ask the Commissioners to change the name of the Department of Mental Health/Mental Retardation to MH/IDD. In 2009, the Commissioners obliged, and Chester County started a wave of other PA counties changing their department name in an attempt to eliminate the “R” word. This year’s campaign served as a reminder of the change in department name, AND a reminder to continue eliminating the “R” word. Pictured with Commissioner Farrell and Commissioner Cozzone are (center front, left to right) Joyce Bobbit and Karen Hayes, and behind them, Jeffrey Holmes.